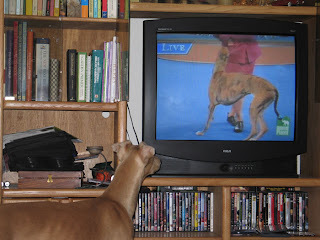 Greyhounds in the Mist: Raising Greyhounds.....set em in front of the tv and have a cocktail for yourself! 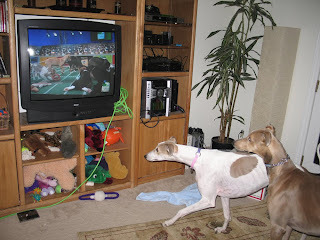 Raising Greyhounds.....set em in front of the tv and have a cocktail for yourself! All of our kids watch TV, some more avidly than others. Dretti? Well, he qualifies as a couch potato. Anything with dogs, they are into. Art started Andretti out early in life teaching him that there can never be enough pillows to settle into and one remote is NOT enough. and of course, he hogs the remote every chance he gets. We have to block certain channels during the day while we're at work. 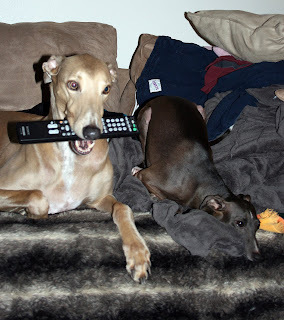 Mostly, the home shopping channels and Animal Planet Home Direct. And don't get me started on computer time. He's limited to 30 minutes, supervised. One delivery from Best Bully Sticks.com was enough to make us rethink leaving Dretti at home alone with open internet access. The Fritzlers did not send us a stupid dog. The picture with the remote is so funny! Andretti does a fabulous "take it, hold it". With ANYTHING.